Some bloggers have such a knack for wowing us with their innovative and inspiring DIYs. The problem, though, is that many of these ideas are incredibly difficult and expensive to replicate. We've come up with a list of the best cheap DIY projects that are not only inexpensive, but they are easy to make. For many of these ideas to cost less than $10, make sure you use coupons for craft stores and shop the sales. A little planning as far as materials are concerned will save you a lot of cash. To upgrade your craft supply storage, all you need are some glass jars, vinyl lettering, and the right kind of spray paint. If you don't have any jars yet at home, shop at the Dollar Store or some thrift shops. Head to your local lumber yard and grab a bunch of wood for next to nothing for this bathroom project. The more aged and imperfect the wood is, the better this bath caddy will look. Terracotta pots are pretty dull by nature, despite being ideal for a variety of indoor and outdoor plants. Get creative with some paint to better match the containers with your space. This shelving unit was made to house essential oil bottles, but it would work well to organize a lot of small household items. Consider placing on a vanity and displaying lipsticks or nail polish. Add some playful style to your dining room with this inexpensive DIY idea. If you can find remnant fabric, this simple project will cost you even less to make. The reversible function also makes this idea more cost-effective because you get two placemats in one. It's easy to find inexpensive mini cheese boards at Ikea or online, so that part won't cost you a ton of money. From there, you can buy a wood burning tool for under $20 that you can use time and time again. Floating shelves make any space look more polished and luxurious, but they can be expensive to buy and difficult to install. Believe it or not, this blogger made both of these shelves for just about $10! This colorful DIY is perfect for regular coffee and tea drinkers that are on the run. Have fun mixing and matching different colors of felt and ribbon. Marbling with nail polish is not a new concept, but it's one to try if you haven't already. Just about any ceramic item can be marbelized, but these coasters are an excellent place to start because they are flat and easy to work with. This cheap DIY project looks much more expensive than it is to make. The crafter took the time to find affordable hairpin legs and explains how to find wood slices for bargain prices. Ceramic paint and sharpies are all you need to transform otherwise boring dishes into one of a kind showpieces. If you plan on adding patterns to the inside of the object without a kiln, keep the piece out of the kitchen and use it to store items like jewelry instead. Blanket ladders are everywhere, and so are the tutorials. However, not all blanket ladder tutorials are created equal. Some will end up costing you more than a ladder would reasonably cost in the store. This tutorial, however, will require just about $5 to make. The main cost in this DIY project is going to be the jute cord you use to wrap the basket. The basket can be found at the Dollar Store for a buck, but the jute might need to be purchased with a coupon to keep this under $10. 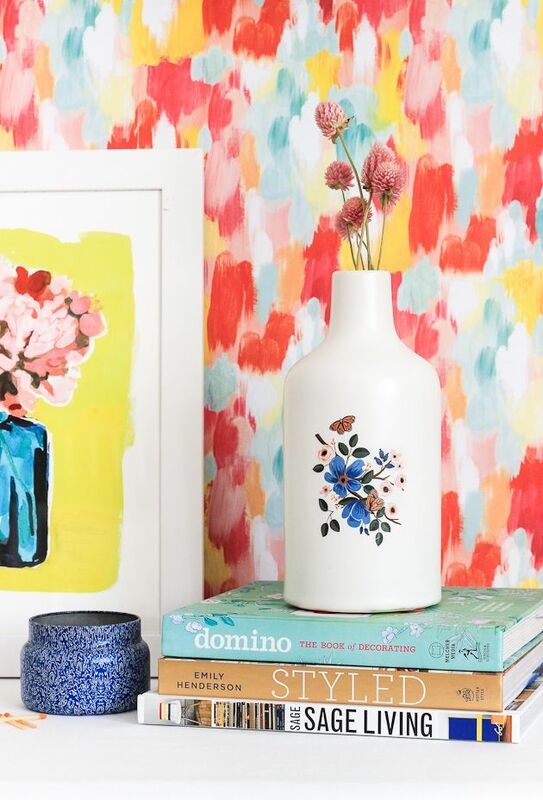 All you need to tackle this DIY is a plain vase and some temporary tattoos. The great thing about this project is that it's both fun and temporary. If you get sick of the design on your vase, just use a little nail polish remover to get the tattoo off and start again. This cheap DIY project is fun to make as a gift and can be customized with different fonts and colors. Remember, you can opt to stack the days of the week on the top or bottom for a slightly different effect. There's one primary material for this project, and that's the macrame. The real challenge with this project will be learning how to do all the different knots and techniques to have your plant hanger stand out. Making candles is a relatively inexpensive craft project, especially if you buy the wax in bulk. This pressed herb candle is beautiful, but be sure to follow the instructions carefully to prevent it from being a fire hazard. Even though some computers don't require mousepads, why not have one anyway when it looks this good? It's possible to either paint over an existing mousepad or create a new one using a thin sheet of cork. Either way, this cosmic scene will likely be a welcomed improvement on your desk. Making tea towels is simple enough using flour sacks or scraps of linen. The challenge for most novice DIYers is how to embellish them to make them look expensive. Opt for simple stripes or get more fancy with stencils like the ones you see here. If you're able to find modeling clay on a discount, you could create multiple ring holders for less than $10, since there's not much to this project. The cactus design is easy to freehand, which makes this project much more manageable to replicate than some other ring holders out there. Believe it or not, the wood for this tiered planter box cost just about $10, which makes this an ideal project for a beginner woodworker. To add more character, consider staining the exterior with a plant-friendly stain. Modern DIY decor projects tend to be less expensive because of the simple lines and minimalist feel. Since there isn't anything too intricate going on here, this wall hanging will be very easy to make. If you're looking to add family photos to the bedroom but want them to feel more like artwork, consider this project. Most hanging frames have a predominately vintage character to them, but these feel sleek and modern. To get the same look, print off your photos in greyscale or a high-contrast black and white. Bulletin boards can look really bland, but this inexpensive DIY idea will turn this desk accessory into a functional piece of wall art. Instead of only using push pins on a bulletin board, consider wrapping some decorative ribbon around it for more versatility.